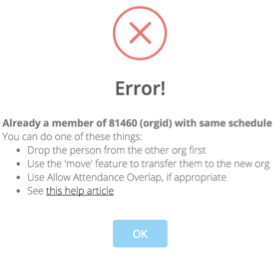 Why do you get this error message sometimes when you try to add a new member to an organization? This happens if the person is a member of an organization that has the same schedule. In other words, it meets at the same day and time. As the message implies, we display that error to prevent you from having a person enrolled as a member of two classes that meet at the same time. For example, say you have a Roberts class and a Williams class which both meet at 9:30. You would not want a person to be a member of both classes. Obviously, they could not attend both classes. So if someone in the Roberts class decides to join the Williams class, you should either first Drop the person from the Roberts class before you add them to Williams class. Or, the easier way it to Move the member from one class to the other one. If one of the organizations does not really meet at that time, you should remove the schedule altogether. We also have an organization Member Type of In-Service , that is to be used when someone wants to stay a member of an adult class (for social events, prayer requests, etc. ), but is teaching a children’s class. Assign that person a Member Type of In-Service in their adult class, and make them a leader in the children’s class. With the In-Service member type assigned prior to enrolling the person in the children’s class, attendance overlap will not be needed, and you will not get that error message. There may be legitimate cases in which you want people to enroll in Organizations with conflicting schedules. For example: You have a 1 hour class and a 2 hour class that both have a Schedule or 8:00 AM Sunday. A person could actually attend the 1 hour class, and then also attend the last hour of the 2 hour class. In this case, you could Allow Attendance Overlap on the 2 hour class. Another use of this feature is for volunteer organizations, where a person volunteers 1 week of the month in the nursery, for example. Use attendance overlap on that volunteer org, so you can enroll someone who normally attends another class that meets at that time. Do not automatically check Allow Attendance Overlap just to avoid getting these messages. Only use it when the org member is not expected to attend both classes for the full class time. The warning is to remind you to Move/Transfer the person from their existing class to their new class.